Following is a Medjugorje travel guide that can help travelers when visiting this popular pilgrimage town for Catholics. Located towards the west of Bosnia and Herzegovina , Medjugorje is also fairly close to Croatia ’s border. The town’s name literally translates to an area between mountains. Due to its location of about 200 meters above sea level, the town enjoys a mild Mediterranean climate. 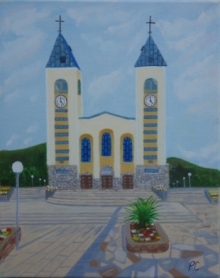 Medjugorje has quite a few historical and cultural sights to visit. But the town is more popularly known for its claims that six Croats have seen visions of the Blessed Virgin Mary here. The claims first started in 1981 and since then millions of visitors from all over the world have come to this quiet town. Known as the Marian shrine, it’s the largest illicit Catholic shrine in the world as it hasn’t been recognized by the Catholic Church yet. The population of Medjugorje currently numbers about 4300 inhabitants. All are of Croatian nationality, speak the Croatian language, write with the Latin alphabet and are Catholic. Politically, the new state under which Medjugorje emerges is a parliamentary democracy.